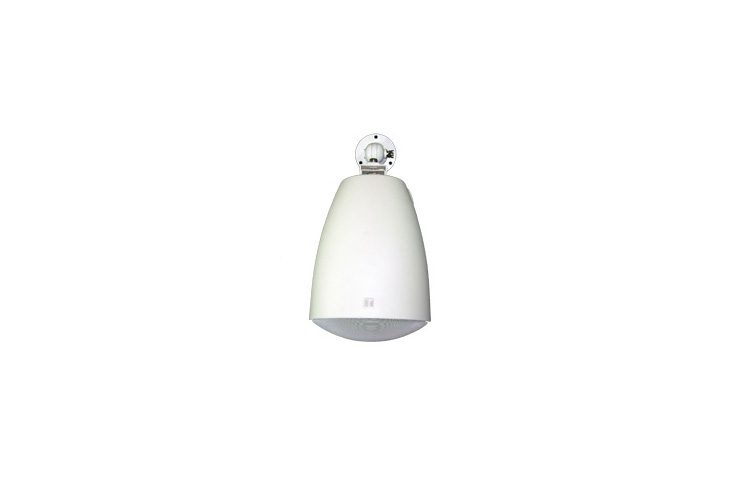 The PJ-304 projection style speakers are built within a bass-reflex HIPS resin enclosure 5″ (12cm) cone-type projection speakers intended for ceiling and wall installation. The PJ-304 projection style speakers are built within a bass-reflex HIPS resin enclosure 5″ (12cm) cone-type projection speakers intended for ceiling and wall installation. The PJ-304 also includes a balanced dome tweeter. They have an outstandingly stylish design that is inspired by the finest lighting fixtures, allowing them to be harmoniously installed with lighting equipment. They are ideally suited for such applications as BGM and announcements at airports, subway stations, art museums and shopping malls. The speakers are easy to repaint, extending the range of design needs they can meet. A supplied swivel bracket accessory allows for flexible speaker angle adjustment. PJ-304 is driven on a high- and low impedance (8 ohm) line. Input impedance is adjustable with rotary switch on the upper side of the speaker. The PJ-304 is backed with a five year warranty.